As simple as a beehive is -- little more than a box full of wood frames -- the bees that thrive inside are instrumental in creating honey and to our food supply. Creating a beehive to house a colony can create a means of collecting your own honey and help pollinate your local crops. Building a beehive means constructing a series of boxes with frames inside for the bees to use to both breed and make the honey. Assembling precut hives from a kit is the simplest form, but you can also build the hive yourself. Consult the plan for the beehive kit, or the plans to cut and build your own. Take careful note of the dimensions of the wood. If you are building your own from scratch, cut and prepare all the pieces according to the plan you have chosen. 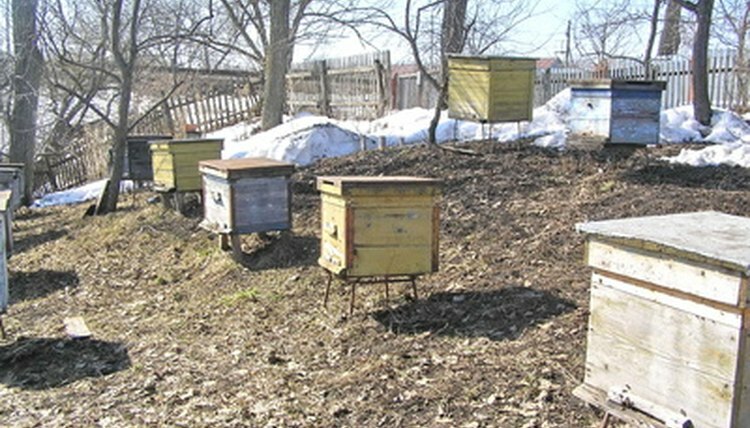 Plans can be found on the Internet, or at beekeeping supply houses. Assemble the tools and pieces to construct the first box. Lay a handled side on a flat surface. Apply a small amount of wood glue to all the jointed ends of the four box sides. Join the two longer sides of the box by fitting the jointed ends together with the handled end. Fit the other handled piece onto the top. You now have a box frame. Nail one joint in the center of one end of the box. Nail another joint at the opposite corner of the box. Do this until one center joint on each of the four sides is secured with a nail. Complete the nailing of all joints on each of the four sides of the box until it is complete. Your box frame is now constructed. Repeat this process for the number of boxes you have chosen for your hive. Paint the hive boxes with a good quality, all-weather latex paint to protect it and keep the wood in good shape. Assemble the frame components much like a picture frame. The top will be the longest piece, the sides the shortest, and all will have notches for the foundation to slide into. Nail the frame together. Pry the wedge from the slot cut in the top bar. This opens the slot you will slide the foundation into. Fit the foundation in place by sliding it down through this opening into the frame. Secure it at the top using the wedge you removed. Nail the wedge into place being careful not to bend the foundation. Load the frame with the foundation into the hive box. Most hive boxes have nine or 10 frames each.